Fear. It’s a natural and necessary emotion. Fear helps us to recognize danger and prepare for it, heightening our awareness and allowing us to perform at higher levels. Whether we fight or flee, fear kicks our bodies into overdrive to meet the challenge. Panic on the other hand is fear taken to an unhealthy and unproductive extreme. Panic can paralyze, inhibiting us from making rational decisions and responding appropriately to a given situation. Or it can cause knee-jerk reactions that may be counterproductive or may even put us in more grave danger. Panic is never good. When facing unexpected challenges, you must keep your emotions in check to prevent them from spiraling out of control and making an already bad situation worse. For years, backpackers and weekend hikers have been told to remember the acronym S-T-O-P if they get lost. The same can apply when you face unexpected trials and hardships, whether it’s the loss of a job or a full blown end of the world as we know it (TEOTWAWKI) event. Unless you are in immediate and life threatening danger, your first response is to stop. Calm down. Get you breathing and heart rate under control. Remind yourself that you can handle this situation. 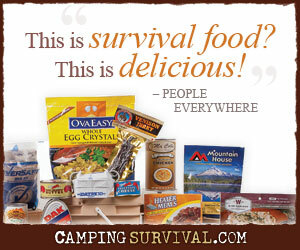 As a prepper, you’ve planned for emergencies, maybe not this exact scenario but you can and will adapt and overcome. The key is to not panic. Once you are calm, it’s time to think about your situation. Assess where your are and what you have with you. Consider the emergency plans. Does anyone know where you are? Are you supposed to meet your spouse at at certain location? Is there a fallback plan should things go awry? If it’s a TEOTWAWKI event, are you supposed to immediately go to the hardware store while your spouse buys as much food as possible? Think about the plans you’ve discussed. Remembering these things will help you consider your next steps. Next, it’s time to assess your your surroundings and environment. If you’re lost, does anything look familiar to you? Do you hear a road or river nearby? For a TEOTWAWKI situation, how are others around your behaving? Is it safe to proceed with your pre-defined plans? Or should you activate your contingency plans? In a crisis, you must take your safety and the actions of others into account. After stopping and calming down, thinking about your situation, and observing your surroundings, the final step of responding to your crisis is to make a plan. Determine what your next steps are. Remember that planning is nothing more than a wish unless you take some action. When you’ve developed your plan, execute it with vigor.